Get Seksy, glamorous style with this sumptuous rose gold-plated bracelet watch by Sekonda. Featuring a chic rose tone crystal set dial, and a dazzling bracelet set with 214 Swarovski® crystals. Perfect for partying. 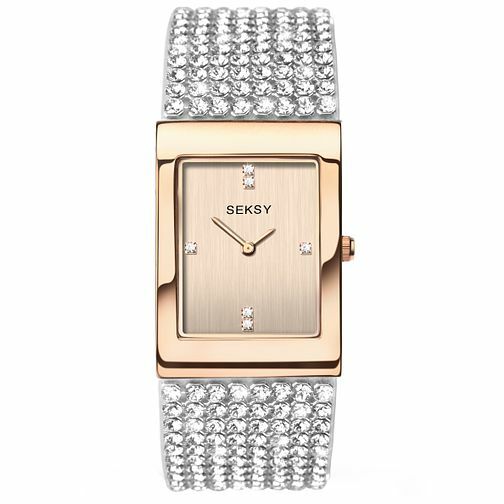 Seksy Ladies' Rose Gold-Plated Bracelet Watch is rated 4.6 out of 5 by 8. Rated 3 out of 5 by Anonymous from Sparkly watch hate the back My husband bought me this watch as a birthday present love the sparkle, colour and size i really hate the back the crystals are on a white rubber band very cheap quality and won't stay clean for long if only the bracelet was metal for the price i would have thought the back would have been better quality i am considering exchanging it. Rated 5 out of 5 by Anonymous from Perfect watch for ladies This specific watch is made with care and its quality is superb.